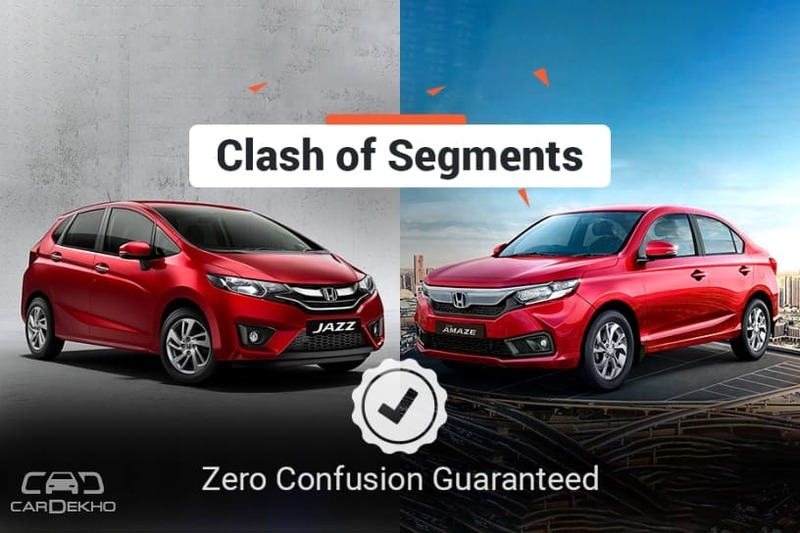 HomeNew CarsNewsClash Of Segments: 2018 Honda Jazz vs Honda Amaze - Which Car To Buy? Priced between Rs 7.35 lakh and Rs 9.29 lakh, the Jazz not only takes on the likes of the Maruti Baleno and the Hyundai Elite i20, it also competes with similarly priced sub-4m sedans in the country. One such sedan is the Jazz’s stablemate, the Amaze, which recently became the first Honda to breach the 10,000 monthly sales mark. Let’s find out which of the two Honda cars offers the best bang for your buck as far as features are concerned. But before jumping into the details, here are the basic differences between the two Honda cars that you should know first. A premium hatchback: The Jazz is a hatchback while the Amaze is a sedan. It also offers a more upright driving position compared to the Amaze. A sub-compact sedan: The Amaze is a three-box sedan with overall length under 4 metres. Being a sedan, it gets a separate boot to store luggage. More space for occupants: The Jazz is a hatchback but its wheelbase is bigger than that of the Amaze. On paper, at least, that gives us a reason to believe that it will have more cabin space than the Amaze. More Luggage Space: The Amaze’s boot has a capacity of 420 litres. The Jazz’s boot space is rated at 354 litres. So with 5 passengers on board, the Amaze offers more space to keep luggage. Petrol-automatic option: The Jazz can be had with a CVT with the petrol engine. The diesel Jazz can only be had with a 6-speed manual transmission. Automatic with both petrol and diesel: Although both the Amaze and Jazz are powered by the same set of engines, it's only the Amaze that can be had with a CVT with both the engines. Firm yet comfortable ride: The Jazz rides flatter than the Amaze. It doesn’t unsettle as much as the Amaze on uneven tracks. Comfortable at both slow and high speeds: The Amaze is tuned to be on the softer side. It’s a comfortable car to be in, be it at city speeds or on the highway. However, it might get bouncy over uneven sections. Both the Honda cars are powered by the same set of petrol and diesel engines, which also produce the same power and torque figures in both cars. However, while the Amaze diesel is also available with an option of CVT along with a 5-speed MT, the Jazz diesel comes with a 6-speed MT only. In this comparison, we will only compare the similarly priced variants (price difference <Rs 50,000) of both the cars. So, we’ve compared the V and VX variants of the petrol Jazz to the V and VX variants of the Amaze. On the other hand, in diesel, the Jazz S is pitched against the Amaze V while the Jazz V is compared against the Amaze VX. Common Features: Dual front airbags, ABS with EBD, rear parking sensors, front fog lamps, alloy wheels, integrated music system with bluetooth and steering-mounted controls, height-adjustable driver seat, adjustable front seat headrests, day/night IRVM, tilt-adjustable steering, automatic climate control and electrically adjustable ORVMs. What Jazz Gets Over The Amaze: Reverse parking camera. What Amaze Gets Over The Jazz: Isofix child seat anchors, power folding ORVMs with turn indicators and push-button start. Common Features (Over previous variants): Power folding ORVMs with turn indicators, 7-inch touchscreen infotainment system with Apple CarPlay and Android Auto, reverse parking camera. What Jazz Gets Over The Amaze: Nothing. What Amaze Gets Over The Jazz: Isofix child seat anchors and cruise control. Verdict: Like the previous variants, both the cars are similarly equipped here too. However, since this is a comparison restricted to which car offers more for your money, the Amaze is the pick here as it offers more features than the 2018 Jazz at a lower price. Common Features: Dual front airbags, ABS with EBD, rear parking sensors, front fog lamps, alloy wheels, integrated music system with bluetooth and steering-mounted controls, height-adjustable driver seat, adjustable front seat headrests, push-button start, paddle shifters day/night IRVM, tilt-adjustable steering, automatic climate control and electrically adjustable ORVMs. What Jazz Gets Over The Amaze: Cruise control and reverse parking camera. What Amaze Gets Over The Jazz: Isofix child seat anchors and power folding ORVMs with turn indicators. Verdict: In our opinion, it’s the Amaze that has an upper hand over the Jazz. While it does miss out on reverse parking camera and cruise control, you can get the camera fitted after purchase and stick it onto the sedan. Only if you are someone who drives primarily on the highway, which is also empty enough that you can cruise at steady speeds, should you consider going for the Jazz -- because of its cruise control feature. Otherwise, the premium of Rs 45,000 for just the cruise control will pinch you. Common Features: Dual front airbags, ABS with EBD, rear parking sensors, integrated audio system, all four power windows, tilt-adjustable steering, height-adjustable driver seat, front height-adjustable headrest, electrically adjustable ORVMs and day/night IRVM. What Amaze Gets Over The Jazz: Isofix child seat anchors and power folding ORVMs with turn indicators, push-button start, automatic climate control, front fog lamps, alloy wheels, steering-mounted controls and electrically foldable ORVMs. Verdict: The Amaze is the clear choice here. It is better equipped than the Jazz and the premium of Rs 25,000 it commands over the Jazz is justified for the features it offer. Except for the Isofix anchors, all other features that the Amaze gets over the Jazz are comfort and premium features that makes it look and feel more premium than the Jazz S.
Common Features (over previous variants): Alloy wheels, reverse parking camera, steering-mounted controls, push-button start, cruise control and automatic climate control. What Amaze Gets Over The Jazz: Isofix child seat anchors and power folding ORVMs with turn indicators and 7-inch touchscreen infotainment system with Apple CarPlay and Android Auto. Verdict: The Amaze continues to be the better value for money option here too. It is not only better equipped than the Jazz but is more affordable as well. Why Buy The 2018 Jazz? More Space: Thanks to its bigger wheelbase, the Jazz might offer more legroom for rear passengers. 6-speed manual with diesel engine: The diesel Jazz comes with a 6-speed MT while the Amaze diesel gets a 5-speed MT. The 100PS engine offers good grunt and the extra ratio should offer it better cruising ability. The Jazz’s slightly firm but more composed ride compared to the Amaze would further make it a more confident car to do long distances in. Diesel-automatic combination: The Amaze is the only car here to be offered with a CVT with the diesel engine. The Jazz gets CVT with the 1.2-litre petrol engine only. Boot Space: With 420 litres of boot space, the Amaze has more space for luggage with 5 people on board. Value For Money: The Amaze offers better value for money than any similarly priced variant of the Jazz. Also Read: Clash Of Segments: Honda Amaze vs Maruti Baleno - Which Car To Buy?